This article is going to look at two of the most popular ranges of indoor smart garden. Click and Grow vs Aerogarden. I’ll outline the key features of each, the advantages and disadvantages and then compare them side by side. A little spoiler – both of them are pretty good but have features suited to different users. Let’s begin. Indoor smart gardens have really burst onto the scene over the last few years. They allow those of us who are too busy or maybe don’t have a green thumb, to look after a range of plants in the comfort of your own home. They automate the delivery of water, nutrients and even light to your plants, to ensure great growing conditions, and successful crops every time. I’ve been using indoor smart gardens for a few years now and have experience of using both the Aerogarden and the Click and Grow. They both have advantages and disadvantages. Overall, I find the Aerogarden range to be more functional and cost effective, but I really like the look of the Click and Grow. Personally, I use the Aerogarden Harvest Elite 360. 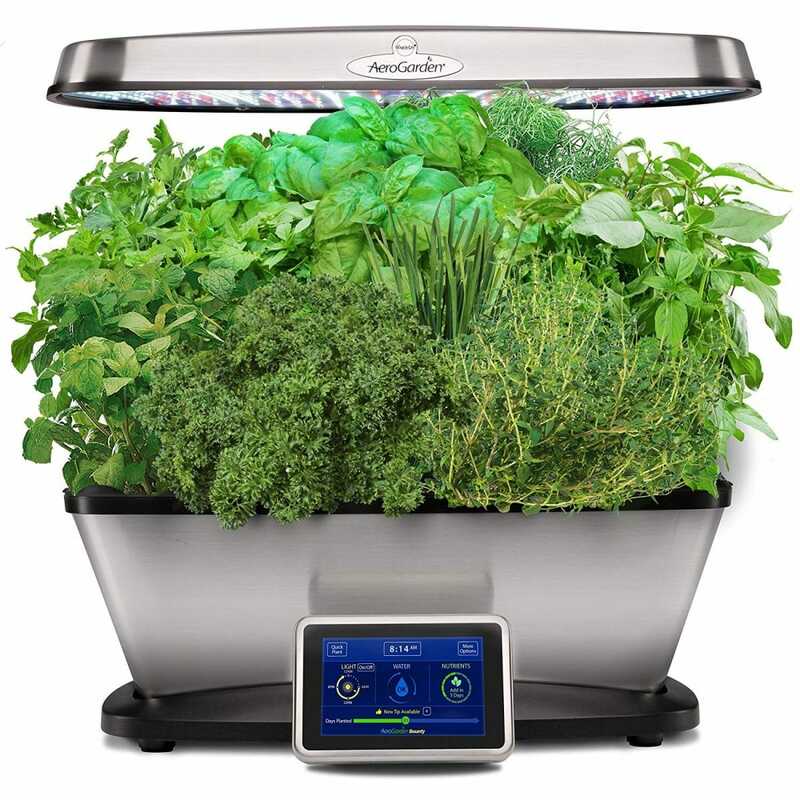 It’s significantly better value than some of the other Aerogarden models, but lacks a few smart features. I found my plants grew better under the Aerogarden grow lights, which are more powerful than those of the Click and Grow. Anyway, onto further details about both ranges so you can make your own mind up! 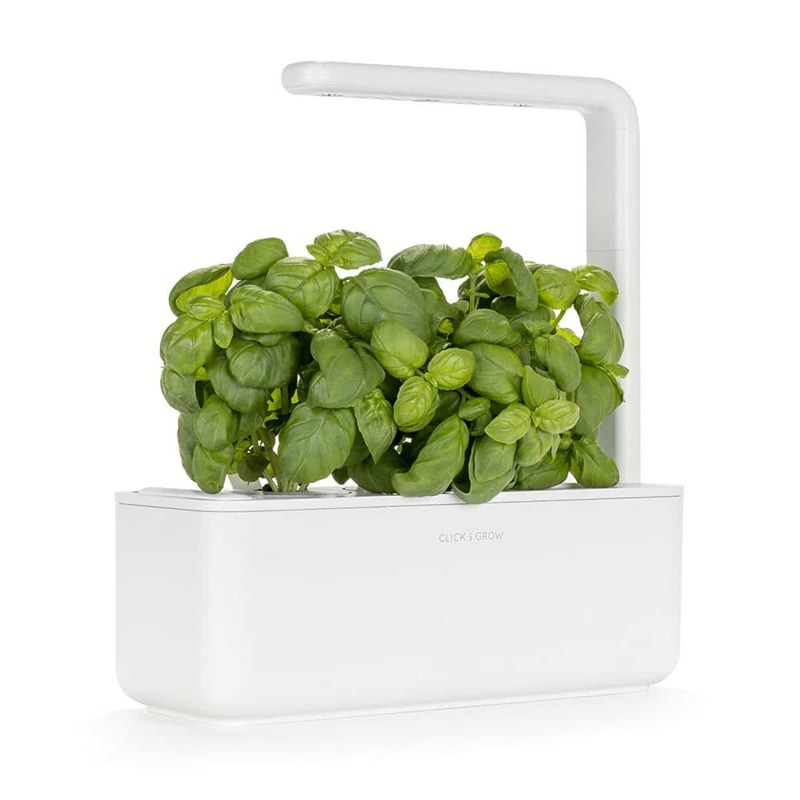 What Is The Click And Grow Smart Herb Garden? Our first smart garden solution comes from Click and Grow. This product started as a crowdfunded product that massively exceeded its funding goal. The aim of the company was to bring technology and nature together, to let anyone grow a selection of herbs and vegetables at home with ease. They came up with the idea of building an indoor herb garden kit with grow light, using hydroponic cultivation techniques, to make indoor gardening foolproof and enjoyable. I’ve written an article about hydroponics for beginners here. Their main product range consists of two smart indoor planters, the Smart Garden 3, and the Smart Garden 9. However, they also offer larger Wall Farm products, which provide significantly larger growing space, in a larger and more expensive package. We’ll start things off with the smaller of the range, the Smart Garden 3. Not only does it come with a light and watering system, but instead of using regular soil, it uses plant pods containing smart soil, which has been specially developed to provide optimal conditions for your plants. The Click and Grow smart garden 3 has an integrated water tank which allows you to add sufficient water that you only need to top up every few weeks. Without having to remember to water the plants every few days, this removes one of the main reasons my own kitchen herbs used to struggle. Speaking of plants, the Click and Grow 3 has space to grow 3 plants at a time. It’s small enough to put on a shelf or kitchen worktop. I really like the aesthetics of the click and grow. It has a really sleek, modern design and comes in a range of colors to fit in with the look of your home. There’s also the light source, which uses efficient LED grow lights, using only 6w of power while in use. The height of the light is adjustable, to accommodate the growth of your plants over time. The light is smart, meaning it will adjust according to the time of day to give the plants enough simulated sunlight. Click and Grow produce more than 40 different types of plant pods, so you can easily grow a range of plants. You can also get experimental plant pods which let you add your own seeds, so you can have a go at growing anything you like. All that’s left to do is to fill the water tank and adjust the light. You won’t be spending more than 5 to 10 minutes every few weeks to keep your plants happy. For those people who feel that the Smart Garden 3 is a bit small, there is also the Smart Garden 9. This is the bigger brother, which allows you to grow 9 plants at once. Again, you have a water tank that you need to refill, as well as a light source that is fully adjustable. Their smart soil does wonders here too, and you’ll find a set of plant pods in the box, to get you started. Once you’re out, you can get new ones from Amazon or the Click and Grow website. As far as those who still don’t think 9 plants are enough, Click and Grow also have their Wall Farm and Wall Farm Mini, which accommodate 51 and 34 plants, respectively. However, they’re more than most people have the space for, and they require a bit more attention, and cost more as well. Overall, I have found the Click and Grow Smart Gardens to be very effective and easy to use. They have a few key advantages and disadvantages that I will outline now. Advantages Of The Click and Grow Smart Garden? The Click and Grow 3 and Click and Grow 9 look great. I have had so many people comment positively about mine when they visit my house. It’s always a great talking point. This is such a simple smart garden kit to use. The setup instructions are great and I only have to spend a few minutes every few weeks attending to the needs of the plants. I spend more time admiring the plants and checking on their growth than I do actually looking after the plants. You won’t notice any impact on your power bill with either the Click and Grow 3 or Click and Grow 9, at only 8w and 13w total power consumption respectively. The nutrient levels of herbs and vegetables is directly linked to freshness. Store bought produce may have been picked and stored for days before it reaches your kitchen. With the Click and Grow, you can literally cut what you need minutes before you put it on your table. Disadvantages Of The Click And Grow Smart Garden? You could easily get a good looking regular planter for a fraction of the price of the Click and Grow kit. All you have to do is remember to water and fertilize it every so often and ensure it gets a good amount of light. For this reason, the Click and Grow smart garden won’t appeal to everyone. But for those of us who love growing plants and like to throw in a bit of technology to make life a bit easier, the Click and Grow is great. Don’t expect to be feeding the whole street with the output from the click and grow. It takes weeks for the plants to grow large enough to harvest and the quantities are fairly small. 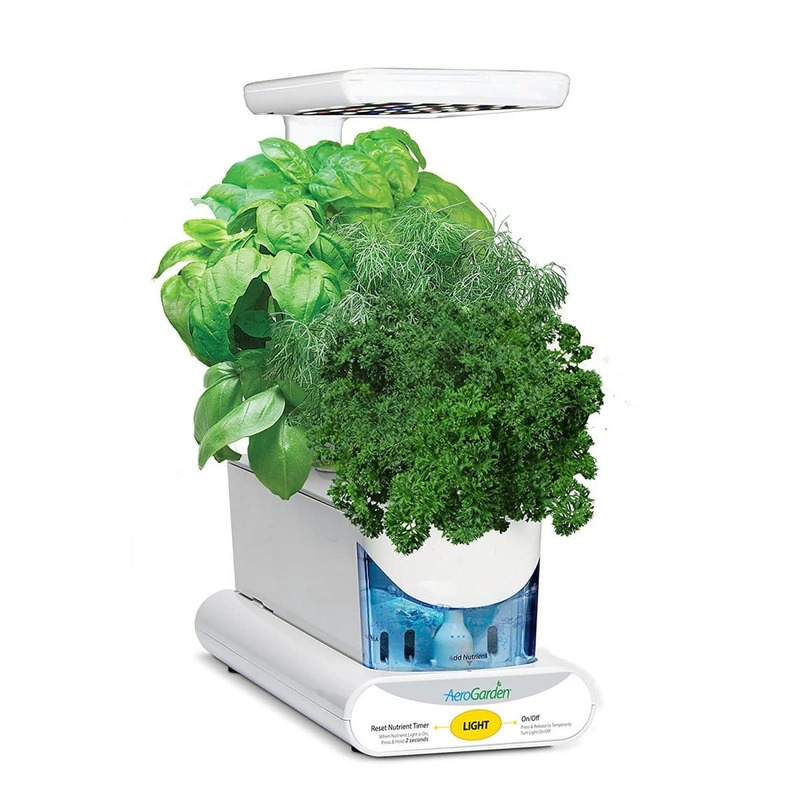 The Click and Grow is ideally suited to growing herbs, flowers and salad for garnish. The enjoyment I have had from mine has totally been worth it, but if i’d purchased it expecting to feed myself with it, I would have been left disappointed. It’s a bit like the “printer and ink” business model. The unit is relatively competitively priced, but the refills are fairly expensive. It’s not going to cost you a fortune, but you can definitely see where Click and Grow are going to make their money. One way to avoid this cost is to reuse the pods with your own growing medium and seeds. I’ve tried this with reasonably good success. What Is The Miracle-Gro AeroGarden? Now we’ll talk about the Miracle-Gro AeroGarden, which is another very popular range of indoor smart gardens, and one of the market leaders in this space. 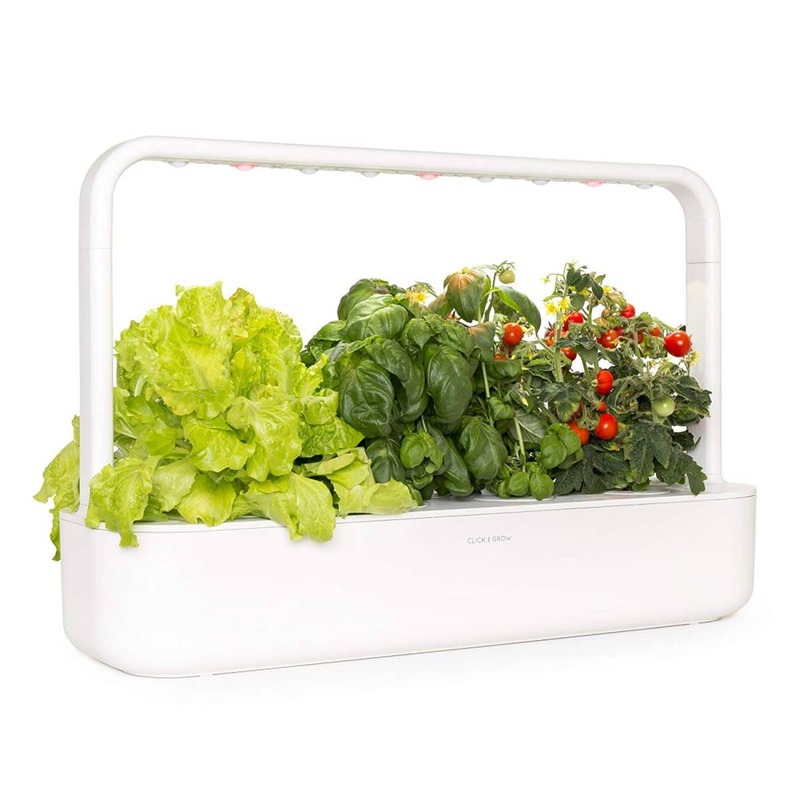 They have a fairly well rounded product line up, ranging from very small planters for only a few plants, right up to the the AeroGarden Farm which can grow up to 24 plants at once, capable of producing a reasonable amount of produce for your kitchen. 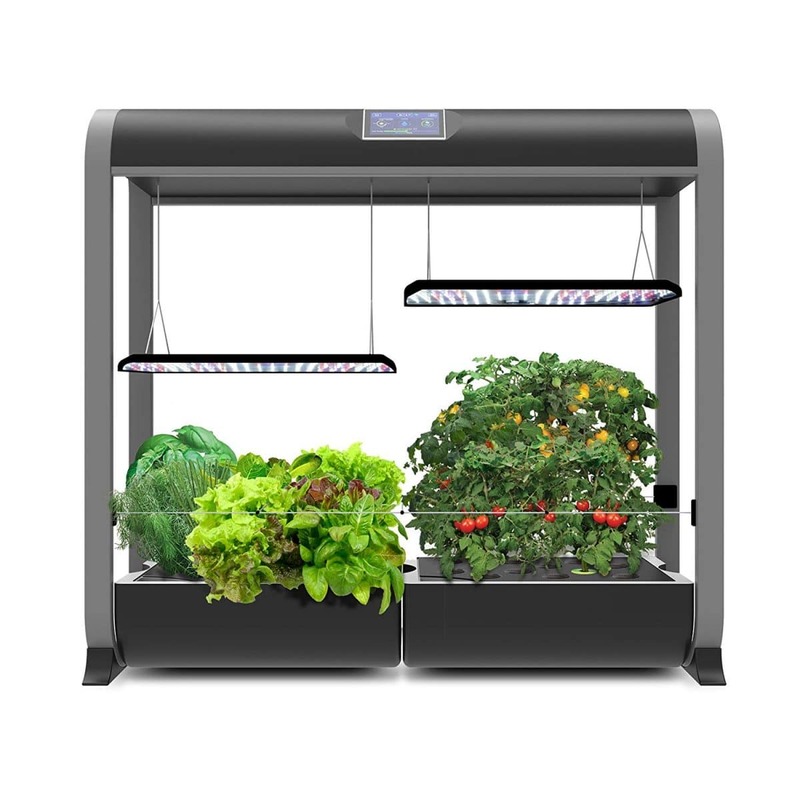 All of the Aerogarden range use hydroponics to grow plants, and have integrated grow lights. They direct you when to top up the reservoir with more nutrients and water, taking a lot of the guesswork out of growing your plants. The great thing about all of these smart gardens, is that they automate nearly everything and make growing a range of plants in your kitchen fairly effortless. There are a large range of colors and finishes to the Aerogarden range, which makes it easier to find one that will suit the design of your house. There are quite a number of options within the Aerogarden range, and it can sometimes be a bit confusing to tell the difference between models. Hopefully, this article will simplify things for you a little. These 6 pod indoor smart gardens come in numerous colors and variants. There are models controlled with buttons, a touch screen or mobile app via WiFi. All use the same growing technology to grow your plants, and are able to grow a reasonable amount of produce in a fairly compact unit. Personally, I use the Aerogarden Harvest Elite. This model lacks WiFI and smart features, but looks great and is one of the most cost effective indoor smart gardens that I have seen. It is up to you to decide whether you want a model with a touch screen, WiFi connectivity or smart functions. The models which lack these functions will grow your plants every bit as well, and the models with WiFi and smart functionality are significantly more expensive. This slightly larger, 7-pod system also upgrades the LED lighting system to a 30W light. It has a different look, which will appeal to different customers. It has a control panel with an LCD display which guides you through the setup process and alerts you when nutrient and water levels need topped up.. 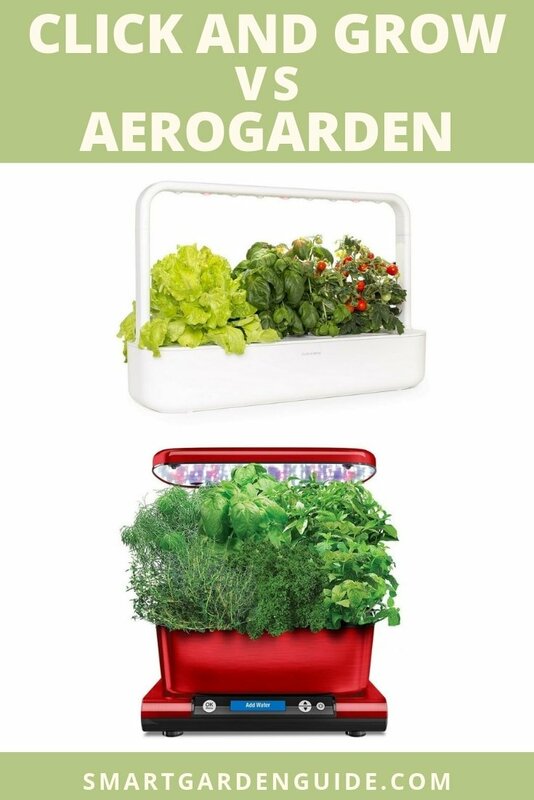 The Aerogarden Bounty and Aerogarden Bounty Elite are both 9-pod planters and designed for people who want to grow a reasonable supply of fresh herbs at home. They each have a 45W lighting system, and they’re both Wi-Fi enabled. The difference? The Elite has a stainless steel finish, compared to the matte plastic one on the regular Bounty. Whilst some of the smaller models will provide a lot of interest and entertainment value, they won’t really produce an awful lot of useful produce. As we move up to the 9 pod planters, you can grow sufficient herbs to keep your culinary activities well supplied. I really like the Bounty Elite, and it was only the price which held me back. 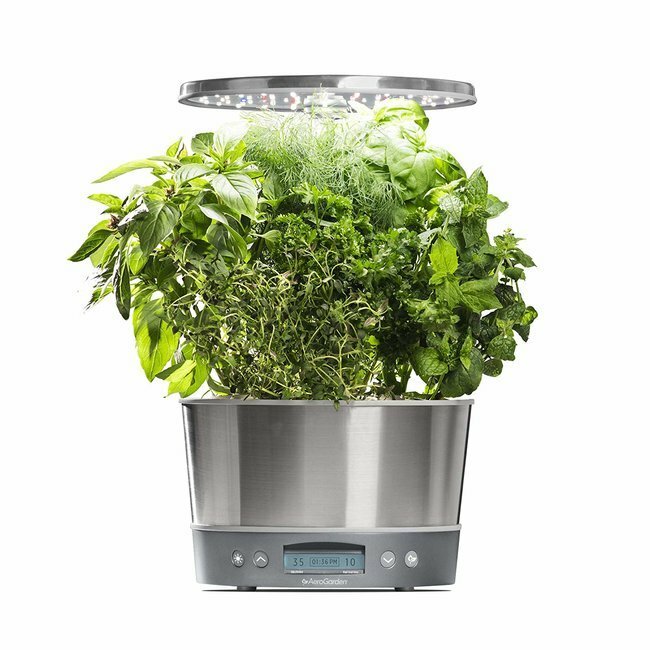 It is a fair bit more expensive than the Aerogarden Harvest Elite, but I think it would be worth it for anyone who wants a genuinely productive smart herb garden. You can compare the current price of the Aerogarden Bounty Elite on Amazon. For the real indoor growing enthusiasts, there is the Aerogarden Farm and Farm Plus. These allow you to grow up to 24 plants at a time. They have all the smart features such as Wi-Fi and app control and come with dual 60W light fixtures. The height of the lights on each model can be adjusted. There are also three variants which allow the grow lights to be raised to 12, 24 or 36 inches respectively. If you want to go big, this is the way to go. In terms of price, these are actually more cost effective than the Aerogarden Bounty models. It is a great piece of equipment which has received very positive reviews. 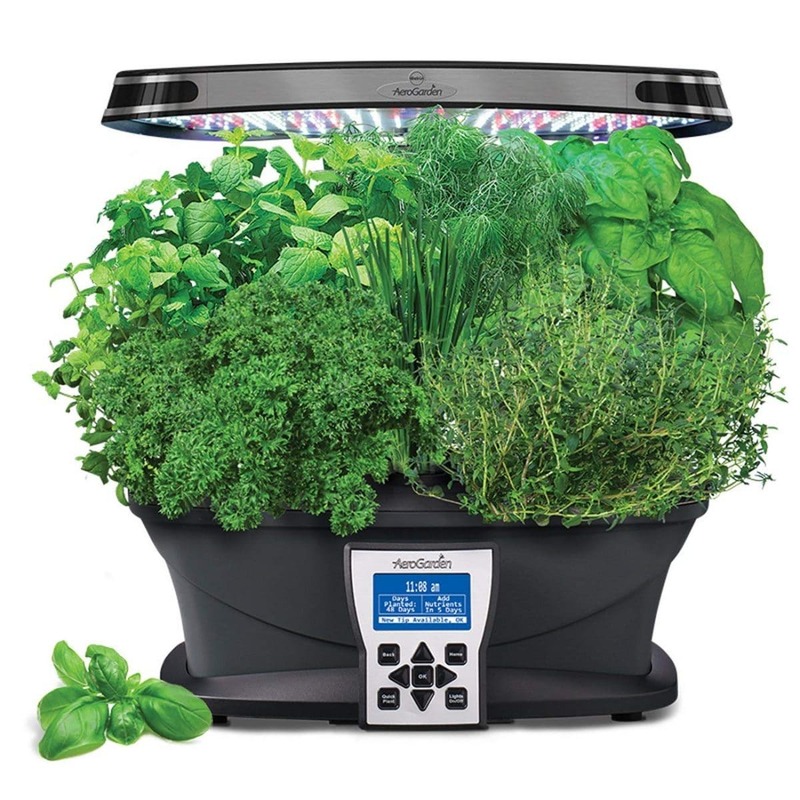 It enables you to grow a lot of fresh produce and would be such an impressive piece of kit in any indoor space. I’ve most definitely got my eye on getting one in the near future. To read customer reviews and to check the current price, head over to Amazon. 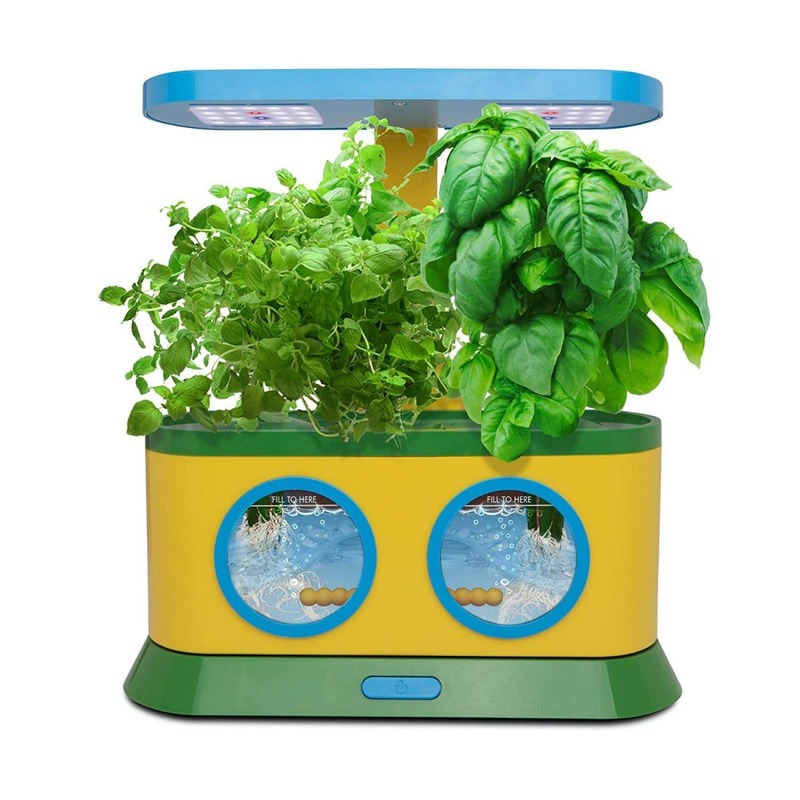 The Herbie is indoor smart garden for kids which can grow two plants at once. It has a bright and fun design, simple instructions and an accompanying activity book. It comes with everything you need to get started and is a great way to get kids interested in growing plants and learning about where food comes from (not just the supermarket shelves). A 3-pod indoor smart garden, and the smallest AeroGarden designed for adults. It lacks most of the more advanced features of the larger units, but still comes with all you need to grow healthy plants. It’s best suited for people who want to grow a few herbs at home while keeping plant care needs to a very reasonable level. The grow light extends to a maximum of 10 inches, which should be enough for most herbs, as long as you start trimming them once they get fully grown. Overall, the Aerogarden range of indoor smart gardens is fairly comprehensive and there are lots more options than those from Click and Grow. Nonetheless, they both offer similar functionality, so your choice will come down to price, size and aesthetics. If you want to grow plants indoors, but want something a bit more fun than a standard planter, or if you’re not great at remembering to care for your plants, then the AeroGarden range is a really good option. And, they’re incredibly easy to use. Advantages Of The Miracle-Gro Aerogarden? It really is easy to grow plants with the Miracle-Gro Aerogarden. Setup takes a few minutes. The machine tells you when to add more water and nutrients. All you have to do is look on with interest as your plants grow. The seed pods have a germination guarantee, meaning Miracle-Gro will replace them if they don’t grow. There is such variety within the Miracle-Gro AeroGarden range that you are likely to be able to find one with a size or finish that you like. The number of replacement seed pods is excellent, giving you great options for what to plant. You can even get seed pods without seeds, allowing you to plant any seeds that you want to try. Disadvantages Of The Miracle-Gro Aerogarden? Undoubtedly, this isn’t the cheapest way to grow herbs and salad greens in your house. The cost of the unit, refill seed pods, fertilizer and replacement LED grow lights could make this quite an expensive option over time. Maybe it’s just me, but I prefer the minimalist styling of the Click and Grow. On the plus side, the range of finishes gives you lots of options. Most of the AeroGarden units aren’t entirely silent. My AeroGarden makes a soft humming sound due to the water pump. It’s not annoying, but if you are used to silence, this might be something to think about. The LED grow lights are bright. Much brighter than a normal home light fitting, and will impact the lighting of whatever room you put it in. Some people find the brightness to be a bit distracting. For me, I put the unit in a room off the kitchen, so the light never bothers me. It’s clear that both the Click and Grow Smart Herb Garden, and Miracle-Gro AeroGarden are products designed for similar people. They’re meant for someone who has a love for homegrown plants, but wants the simplicity or interest, of using technology to help grow and maintain them. Or maybe you just want something that adds to the aesthetics of your home, which most of these units undoubtedly will. 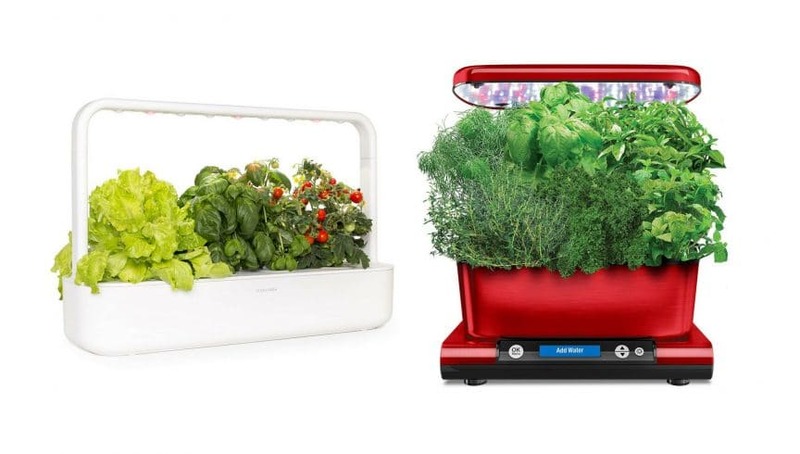 The obvious comparisons to make here would be between the AeroGarden Sprout and the Smart Garden 3, as well as the Bounty and Bounty Elite versus the Smart Garden 9. I think the Click and Grow smart gardens get the win here. The styling is so cool and just blows the AeroGarden away. For a lot of people who are purchasing an indoor smart garden, it is a fun, premium item, to add a bit of character to an inside space. The look of the unit is quite an important factor. I’d love to know what you think. Maybe it’s just me that thinks the Click and Grow products look awesome. The smaller Click and Grow Smart Garden 3 is more expensive than the comparable AeroGarden Sprout LED. However, when comparing the 9 pod units, the pricing is fairly similar. The one anomaly is the AeroGarden Ultra, which is a smaller 7 plant unit, but which is priced at a significant premium and I can’t entirely work out what justifies this extra cost. Both brands of smart garden are designed to be really easy to use. With the AeroGarden, you have more control options, depending on what unit you pick, but in terms of setup and looking after your plants, you will find it hard to go wrong. Both the Click and Grow and Miracle-Gro Aerogarden ranges have a wide range of refill seed pods and both also give you the option to plant your own seeds. The Aerogarden range has a greater choice of additional accessories, such as supplemental water reservoirs, propagator kits and replacement LED grow lights. The Click and Grow seed pods are more expensive to buy, so this may be a factor in deciding which unit to go for. Generally, the Aerogarden units have higher output LED grow lights. This may become an issue if you are using the Click and Grow Smart Garden in a very dark room or in countries where the winter months have very poor light conditions. Click and Grow do suggest that additional grow lighting can be used and provide helpful information to assess your plants for signs of low light stress. Indoor smart gardens are an interesting category, and one that’s been rapidly picking up steam among lovers of homegrown plants and herbs. And that’s to nobody’s surprise – the tech inside these planters makes them a great option. With two of the most popular options on the market covered, which one would you go for? Your call.